Maggie, a Labrador retriever owned by Trent Zimmerman of Baraboo, stands near a white deer fawn in a woodlot in Sauk County. Zimmerman and Maggie encountered the rare deer while searching for mushrooms. Photo courtesy of Trent Zimmerman. Trent Zimmerman of Baraboo and his dog Maggie went searching for mushrooms and shed antlers on Sunday in Sauk County. The sheds totally eluded them and they came home with a grand total of one delectable fungi. But they did encounter something even rarer and more memorable than old antlers or sprouting shrooms. Just moments after finding the only morel of the day near a cluster of elm trees, Zimmerman and Maggie walked a few steps and surveyed the forested landscape. It was definitely a first for Zimmerman and Maggie. The animal was entirely white except for its dark eyes and pink nose. Zimmerman estimated its height at 17 inches and weight at 8 pounds. Zimmerman pulled out his cellphone and began taking video of the encounter. The fawn tottered on its spindly legs as Maggie, a 1-year-old Labrador retriever, walked over to investigate. Zimmerman can be heard on the video telling his dog to back off, an order to which Maggie promptly complied. Zimmerman, an avid hunter and angler who owns a sealcoating business, spent about the next minute looking in amazement and capturing video. Trent Zimmerman of Baraboo photographed this white deer fawn in Sauk County. The animal was likely born just hours before Zimmerman and his dog Maggie encountered it on May 13, 2018. Photo contributed by Trent Zimmerman. “Its hair was still damp and looked like it had been born just hours before,” Zimmerman said. With a white-tailed deer herd of more than 1 million animals in Wisconsin, it’s not uncommon for people to see deer fawns in spring. But it’s extremely rare to view one that has all-white hair. Most animals feature a range of color variations, including albinism (an absence of pigment) and leucism (a partial loss of pigmentation). 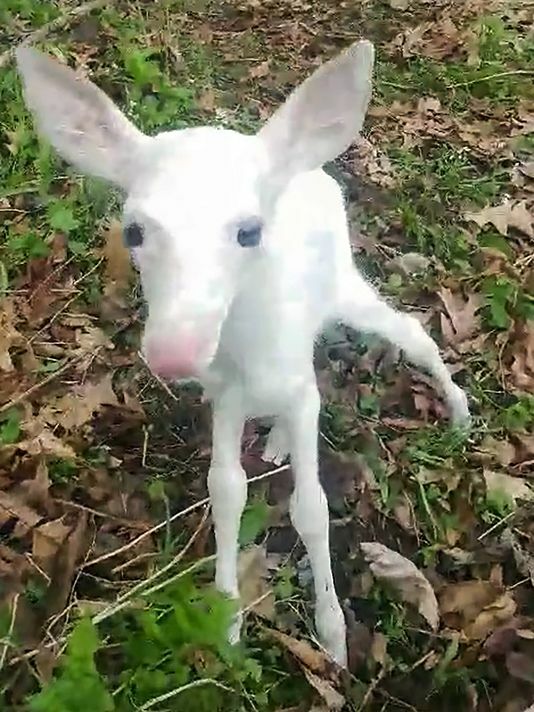 The fawn Zimmerman saw was leucistic since it had colored eyes. A third color classification – piebald – is used to describe deer with patches of brown and white hair. How rare are white deer? It’s difficult to determine the frequency, according to scientists, but some estimates put it at 1 in 20,000 or 30,000. What’s known is there are local populations that harbor higher proportions of white deer in Wisconsin. A herd that includes several white deer near Boulder Junction draws visitors each year and was the subject of “White Deer, Ghosts of the Forest,” a book featuring the photographs of Jeff Richter and text by John Bates. In southern Wisconsin, white deer are sometimes observed near Dousman in Waukesha County, said Rick Reed, warden supervisor for the state Department of Natural Resources. Zimmerman said they are also known to live on and around the property in Sauk County where he saw the white fawn. White animals tend to survive at lower rates in the wild since they are easier to spot by predators. In Wisconsin, white deer are protected by DNR rules and may not be shot by hunters. Most white-tailed deer in Wisconsin give birth in late May or early June. 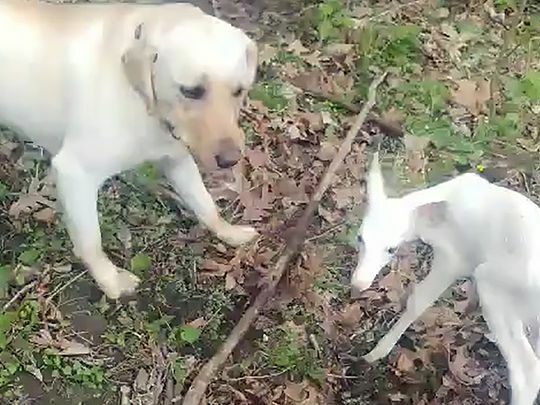 The white fawn encountered Sunday in Sauk County is part of the advance guard of the 2018 class. As with all young wildlife, it’s important to leave fawns where they are found. An adult is likely near and will return soon. Female deer will leave their offspring in grassy or brushy areas and return several times a day to feed them. The process continues until the fawns are strong enough to run and follow the doe. In many tribal legends, the sighting or birth of a white animal portends good things to come. Zimmerman, who has hunted and fished for more than 30 years and founded Huntn & Fishn Kids to help introduce youth to outdoors activities, knew it was important to limit contact with the fawn. After capturing three short video clips of the animal, Zimmerman summoned Maggie and they backed out of the area. The entire encounter lasted less than 2 minutes. At first the fawn attempted to follow Zimmerman.